We’re happy to announce that POSEFY is quickly gaining momentum, thanks in part to a couple of media outlets that have recently featured our service. 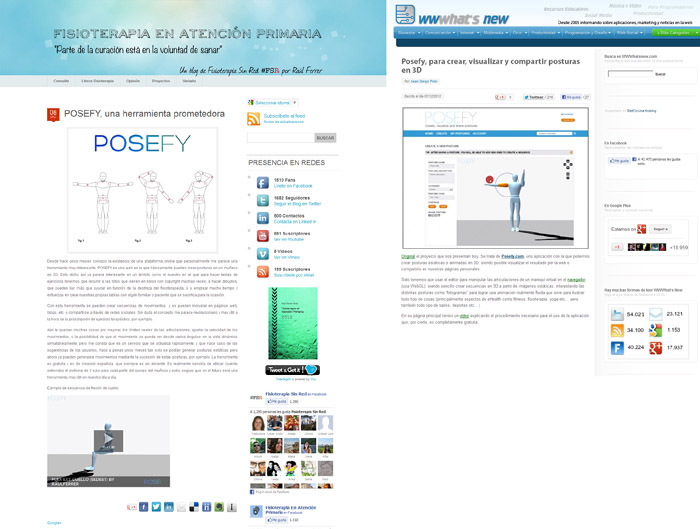 Wwwhat’s New, a prominent website that has been covering startup activity in Spain and Latin America since 2005, referred to POSEFY as a promising and innovative tool that can enhance value for professionals in a number of sectors such as fitness, yoga and physical therapy. Fisionenap.com, a website specializing in the use of emerging technologies for the physical therapy community, also featured POSEFY as a great alternative to the traditional tools used to illustrate postures and exercises for a healthy living. Our User base is increasing at a steady rate, and we are receiving excellent feedback from the Users that have tried our most recent feature: animated 3D sequences. Have you tried POSEFY already? Please let us know what you think!